Some have asked me why I have not updated my climate blog in a while. Frankly, the climate debate has become like the movie Groundhog Day, with the same handful of scientists releasing the same flawed studies making the same mistakes. What used to be exciting is frankly boring. I still blog here on updated climate news, and perhaps the IPCC will give us new things to write about soon, but for now most of my climate work will just be making appearances and presentations (let me know if you have a large group, I don't charge any sort of fee). For a while now I have been contemplating a new focus area, perhaps even a new blog. I call this new focus "trend that is not a trend." It refers to the tendency I find in the media to cite a trend without any supporting data, sometimes even when the actual trend in the data turns out to have the opposite sign. Sometimes the reporter is motivated by conventional wisdom, sometimes by passion in advocating for a certain issue, and sometimes they are fooled by their own coverage, mistaking increases in coverage of a phenomenon for increases in the phenomenon itself (for example, this year everyone believes wildfires are up, when in fact this is a very low year). We get a lot of this type of thing in climate, so it will give me a chance to continue to blog on climate but from a slightly different angle. My point, however, is not to challenge the basic premise of the article, but to address this statement in her opening paragraph (emphasis added). Despite a rash of deadly train crashes, the railroad industryâs allies in Congress are trying to push back the deadline for installing technology to prevent the most catastrophic types of collisions until at least 2020, half a century after accident investigators first called for such safety measures. 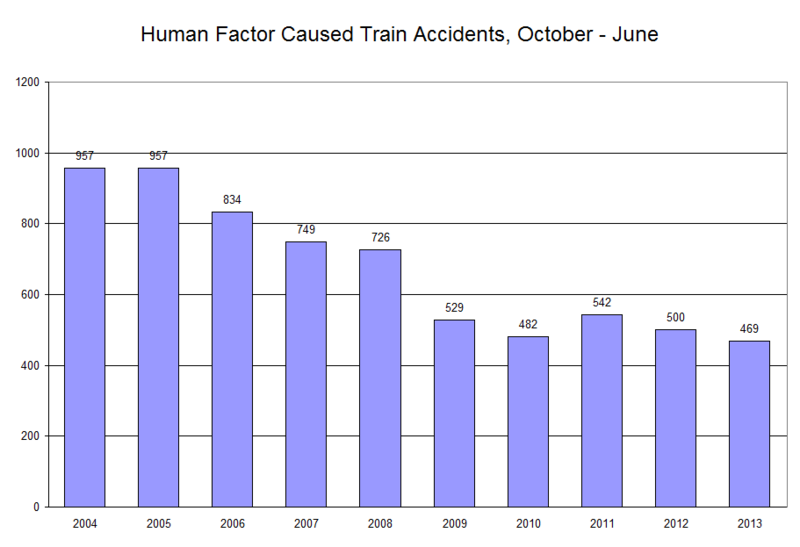 The reporter is claiming a "rash of deadly train crashes" -- in other words, she is saying, or at least implying, that there is an upward trend in deadly train crashes. So let's ask ourselves if this claimed trend actually exists. She says it so baldly, right there in the first seven words, that surely it must be true, right? The National Transportation Safety Board has investigated 27 train crashes that took 63 lives, injured nearly 1,200 and caused millions of dollars in damage over the past decade that officials say could have been prevented had the safety system been in place. Astute readers will note that this is not a trend, it is one data point. Has the number increased or decreased over the decade? For comparable decades, are 27 crashes and 63 deaths a lot or a little? Is it a "rash", or a tapering off? We have no idea. As we get further into this series, readers will be surprised at how often the media uses single data points to "prove" a trend. 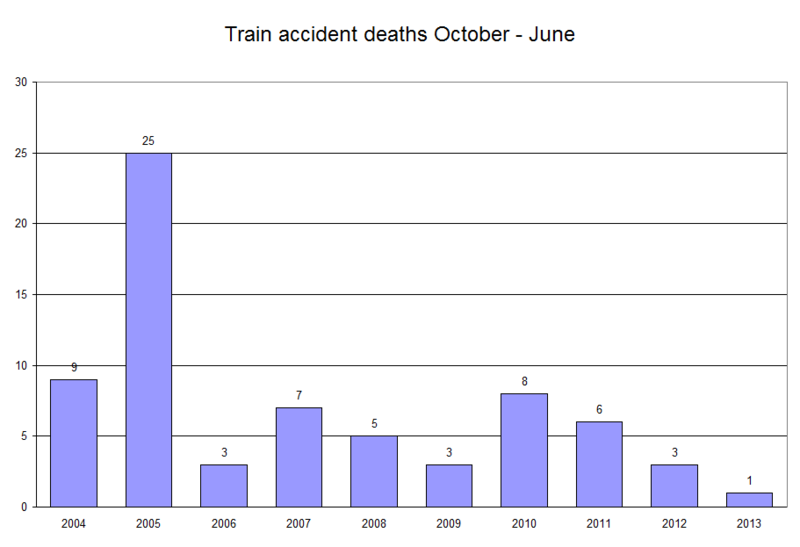 The July high speed rail accident in Spain, which killed scores of people. Of course, readers may note that she actually had to go to another country for her first example, an example involving high-speed passenger rail which has very little in common with private railroads in the US. A 2008 crash blamed on inattention of a Metrolink driver -- a government employee on a government train, which sort of undermines the basic thrust of the story that this is about evil private railroads using lobbying to endanger the public. Few readers are likely to consider a 2008 crash to constitute a recent "rash." 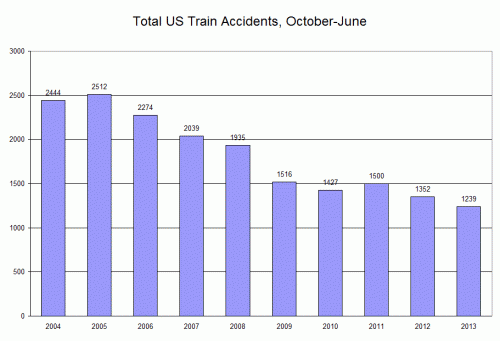 A 2005 crash at a private freight railroad that killed 9 people from a chlorine gas leak. Fewer readers are likely to consider a 2005 crash to constitute a recent "rash". So let's go to the data. It is actually very easy to find, and I would be surprised if Ms. Lowy did not actually have this data in her hands. 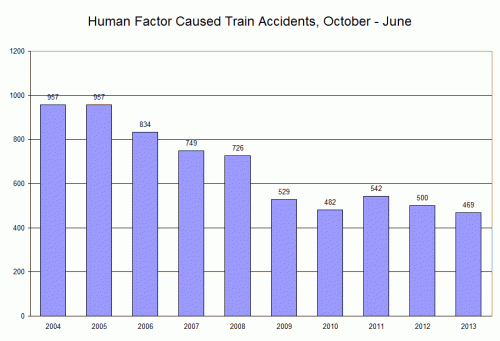 It is at the Federal Railway Administration Office of Safety Analysis. 2013 data is only current through June and seems to be set up on an October -September fiscal year. So I ran the data only for October-June of every year to make sure the results were comparable to 2013. Each year in the data below is actually 9 months of data. So, rather than a "rash", we have just the opposite -- the lowest number of deaths in a decade. One. I will admit that technically she said rash of "fatal accidents" and this is data on fatalities, but I'm going to make a reasonable assumption that one death means one fatal accident -- which certainly cannot be higher than the number of fatal accidents in previous years and is likely lower. Not only is there not a "rash" but the number of accidents have actually been cut in half. But let's give the author one last try at a benefit of the doubt. She says the technology she is advocating reduces human error caused accidents. The FRA actually tracks these separately. I wonder what that trend is? LOL, if anything it declines more. 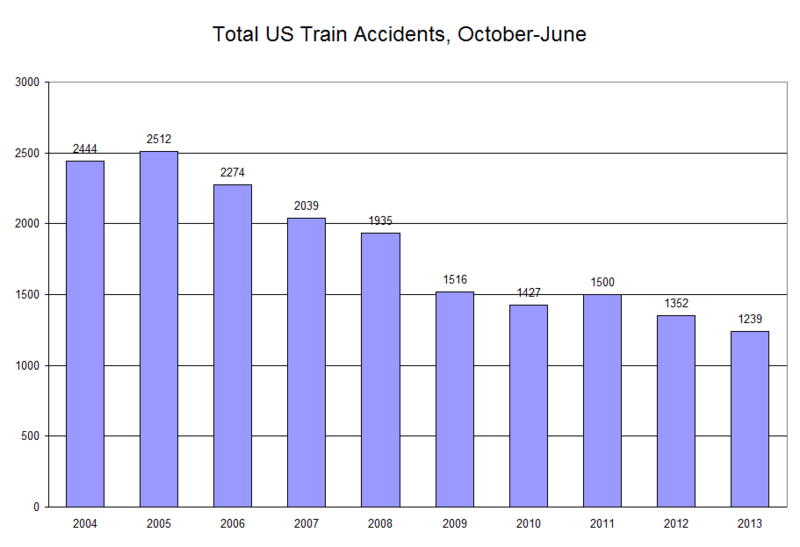 The only thing I can possibly find in her favor is that number of train accident injuries spiked in 2013 after 10 years of declining, but since fatalities and accidents went down, the odds are this is a statistical anomaly and not part of any trend. Postscript: To my point above, 1 person died from train accidents in the last 9 months or so. We don't know why or how they died, but let's just say it was preventable by PTC. The author is therefore castigating railroads for not racing ahead with hundreds of millions to prevent one death, when the railroads know their chief focus for reducing preventable deaths should be on the 588 other people who died on the railroad in the same period, mainly from grade crossing and trespasser/pedestrian accidents.